I crave to travel, and till that craving has a remedy called “pack your bags and start for exploring a new place”, I am hardly at peace. This time, I wanted to travel to hills. I had no idea where would I land. I quickly spoke to some friends, under a hope that I would get a company, like each time. Well, no, no one was ready enough to be as crazy as I was, to be prepared to travel within few days. There’re next month plans suggested, summers plan so and so, but how about the craving. It’s difficult to explain that thing you know. Only the craver knows how it feels inside. That feeling of getting out of comfort zone, that feeling of experiencing newness, that feeling of looking at new monuments, talking to new people, having new food, new taste, new journey, that feeling of new you… And so, after a day’s thought I decided to travel alone. Mcleodganj is one place which was on my mind since years whenever I use to think of a hill station but the plan never materialized. So I researched about what all can I do in that place and around and make the best out of the trip. For the craving to travel, for the favorite month of the year- February, to live the passion of photography, for collecting and creating more stories, for testing own stamina, for knowing self more, for knowing the unknown, for treating self with happiness, for making the best out of pre-birthday weekend – I treated myself with A Solo Trip. To travel alone, two things are very important: – Safety in terms of place to stay & Secure Mode of travel. Rest of the things can alter as per the mood, requirements and climatic conditions. I figured out a hotel as per my requirements and I made sure that I had a confirmed booking in Himachal Road transport Services Bus, since it’s safe and comfortable. I reached the ISBT Kashmere gate bus station on time and figured out the bus I had to travel in. Boarded the bus and like always as a childhood habit and interest, I acquired my window seat for the night. Window seat has its own kind of privacy and at the same time when you are travelling alone, you look for the face who is gonna be your neighbor for that particular journey.. somehow it always matter to us, isn’t it. Be it in flight or in a bus. Unknowingly it defines our comfort in our minds. As per the booking an Uncle was suppose to be my neighbor, but interestingly I got to have a conversation with a group of young people travelling to the same destination and in that group I happened to communicate with this girl, named Puja, who happened to be my real neighbor (seat was exchanged with uncle). We had a great chit chat time and shared videos on travel, we shared songs and we shared our plans that we had in our minds for destination which’s going to be. I love journeys and all kind of journeys, even a bus journey does excite me. The Volvo bus has this great glass which has support of the frame at broad distances and so the view that one can see outside is so damn clear and appealing. The roads of Delhi were clear for a change and while we moved through Karnal road, the dhabas at Murthal were refreshing my drives from Delhi with various friends to this part. The room with a view was waiting for me, it seemed. I have been very lucky on all my trips to get a corner room, having a window opening towards east, the sun rises calmly from this side and each ray has so much to absorb. This time again I had this opportunity and smile that window view gave me, gave a kick start to the trip. The tall trees loaded with green leaves and somewhere in between them, the sun rays making their way to the window of the room, It was just perfect. There is so much that the window says. A window of the room to the window of the thoughts. The sun rays coming in brightens the thoughts and acts of the day. The sun plays the role of the shiner in all times. Be the sun of the other’s window or be the window of positivity…choose and whatever, totally 😎. The hotel care taker served me delicious parathe with chai and I was all geared up to explore the hills around and the beauty they carry. i walked through the market area and local residential areas for about 3 kms to reach Bhagsunath temple. Bhagsunath Temple is a Shiva temple situated about 3 kms from Mcleodganj, located at a height of 1770 m above sea level. The temple visit was peaceful and then lay the trek to Bhagsunath fall. There is a small pool in the premise of the Temple area, where devotees come and take bath to purify themselves. The view opposite to the way you walk towards fall, is mesmerizing. One can see lush green area, to the far away mountains, then you find leafless trees and on the same way you also find the bright red color flowers. For me, the walk towards the fall was solo. As soon as I had reached the fall, I met the fellow strangers with whom I had conversed in the bus, it was a nice co incidence. One of them clicked me in front of the fall. The feeling of reaching a destination is always joyous, the walk towards the fall for about an hour was such. Under the bright sun and windy afternoon, everything around was shining, it was the shine of accomplishment, freshness in nature, the shine of being you. The view of the sky that afternoon …. Cloudy and heavenly indeed! The moment one steps in its premise, one feels the touch of peace. There was a sitting area on the ground floor and on the first floor was the temple. Look at these vacant benches, clean, polished, ready to welcome… quarter part of this area was seated, and the other part was vacant. Stepping in this part seemed to be disturbing the elegance of the view, the sequence of the benches; seemed will break, the sunshine and then shaded area, grass filled area and rocky area, it seemed to be a planned view to show the beauty of life and its shades. I found life in this view, which is open to challenges and is warm, which is hostile and is beautiful. Opposite to this view was mountain of Dhauladhar Range, with snow of course, but also clouds; clouds which were moving so fast that they were looking like smoke, but a deep look at the view, showed the real them. The first view of Lord Budhha at Dalai Lama Temple was to hold time ; there is unique kind of harmony that each look of his has and this was one of such looks. People visit the temple to meditate. They light Oil candles and pray for peace and harmony. The food was tasty enough !!! Its an Anglican church in the forest near Forsyth Ganj. This neo gothic stone building was built in 1852. In the earth quake of 1904 in Kangra region, this church was damaged badly. This monument was rebuilt and saved as a archeological site and is of importance in the history of the region. Since 1958, the church doors are closed for public but is maintained by the government under Ancient and archeological sites and remains act 1958. The road ends here. There is no further going from here. Yet the walking paths gets divided into two. One shows the range of mountains – the Dhauladhar range and other part leads to the sun set view point. Naddi is located 2000 meter above sea level. The way which leads to the view of the range, also leads to a government school. The walking way is nice enough to experience silence and experience the best of the times of conversation. It’s a perfect way to walk + talk + understand + unwind= live. My Sun sets to rise again. Setting could be such a beautiful thing, I have been able to learn this from the way the Sun sets. The way every second it beatifies the sky and leave a speechless time for us. I was alone, sitting in Sunset café, an open café; and I had so much to delve into. It was a perfect time of self introspection and really knowing my own needs. I believe that the sunset watch is one of the most romantic things that we can treat ourselves with. Well, I treated myself greatly that day. Every sunset point and watch is very very different, and so was this, yet each time the beauty it gives and goes away is just unique in its own way. Norbulingka Institute was founded near Dharamshala in 1988 for preserving Tibetan culture, literature and art. The institute is named after Norbulingka, the summer residence of the Dalai Lamas in Lhasa, Tibet. The institute primarily works towards carrying on Tibetan traditions and heritage by providing training, education and employment to Tibetans in the region. Norbulingka produces high quality art objects, clothing and home furnishings. The institute also has the two-storeyed ‘Seat of Happiness Temple’ (Deden Tsuglakhang) set amidst the Japanese inspired Norbulingka gardens. It is especially known for its 1,173 murals of Buddha, frescoes of all the Dalai Lamas and drawings from the life of the 14th Dalai Lama. Norbulingka’s art studios include Tibetan statue making, Thangka painting, screen-printing, applique and tailoring, woodcarving, wood painting, papermaking, and wood and metal craft. As soon as you enter the premise, there is an inexperienced air that surrounds you. Its just magical. There is so much of art & knowledge around. People – calm and soft spoken, smiling and welcoming. There is Losel Doll Museum which has diorama displays of traditional Tibetan scenes, using miniature Tibetan dolls in traditional costumes. The scenic view up in the sky and through the terrace was beautiful. of course the trees added to the beauty… i could have sat for hours and watch the moving clouds changing the view of the sky. The day I was there, there was cleaning and painting going on, because on 9th March’17, Dalai Lama was suppose to visit. In the preparation of his welcome, there was lots of preparation going on. Hence I couldn’t witness the Golden coloured Buddha statue in the monastery. But yes clicked picture s of the hall to keep the memory that why I couldn’t see him, yet watching all these activities was interesting enough. This piece has been created by stitching n no. of cloth pieces and then this is framed with brocade cloth around. A person making design to be cut and stitched.. These painters that you see are reputing the colors on the walls of the entrance to the main building area. They’re focused and perfect, with music in the background. I found this curved dried flower, hanging silently with beauty in every bit, I couldn’t take my camera off to click it. One of the most famous monasteries in Tibet, the Gyuto Monastery is known for its study of Tantric meditation, Tantric ritual arts and Buddhist philosophy. It was founded in Tibet in 1474 by the main disciple of the first Dalai Lama, Jetsun Kunga Dhondup. After the communist Chinese invasion in 1959, the monastery was re-established in India. The monks here practice the major Tantric texts including Guhyasamaja, Chakrasamvara and Yamantaka. They have passed these lineages on to the younger generation of monks for more than 500 years. The main chamber of the monastery has a majestic statue of the Buddha and with the backdrop of the snow-clad mountains; this is an extremely serene and peaceful place to spend an afternoon. I spoke to various monks; some of them were very surprised seeing me travelling alone. They inquired and were anxious how it to do so is! Well, I could only smile back and tell them that its really going cool. Post this where I landed is one of the most beautiful thing that I have ever witnessed. From Norbulinga Monastery Area it took me 2 hours to reach Masrur Village. The village area in Himachal Pradesh is clean and the roads are well constructed. It was only the last 500 meters of way that was raw, which made me feel that I had entered the village area 😉 . The very first glance on the temple back side wall, made me feel stunned. It was beauty never seen before. I took my entry ticket and walked in, took off my shoes and each moment kept wondering of the structure, sculpture which was right there in front of me. Kangra faced earthquake in 1905 and these temples were also were victim of the same. There was extensive damage that the occurrence brought, their unified scheme suggest that the temples were to follow a ‘sarvatobhadra’ plan (accessible from all cardinal directions). The excavation of the temples , however, couldn’t be completed for unknown reasons . Inherent texture flaw in the “mother rock” might be one of the reasons to abandon the excavation midway. Most probably, the Masrur Temple complex was built by a paramount ruler of ancient Jalandhar kingdom of Punjab plains or by a Katoch ruler under the supremacy of Yashovarman, a king of Kanauj. The place didn’t seem to be very famous among tourist as I saw only two foreigners and some local people in its premise. Foreigners appreciating the beauty of the premise and history ! On the right side of the temple is a Senior Secondary School . The students of the school looked very smart and disciplined. It was very nice to witness the reach of education system that some of our states have. On the way back to Kangra main district from Masrur Village, the cab driver Viay Bhaiya suddenly saw lot of lambs and goats and showed me the same. I couldn’t resist and went out of the cab to look at what was so wondering that he being a local person got so excited. The exciting thing about that view was this that the goats and the lambs were sitting on the sliding side of the hill, there was hardly any base for them to set themselves, the wondering thing was their adaptation to the Hills. Between ‘Masrur’ and ‘Himachal Pradesh Cricket Association Stadium’, on the way was found this unique view of goats and lambs standing and then roaming on the wall side of the hill. How they roam around in groups, without human interference and how they make their way to their home is amazing. Without expression of words they understand each other and the circumstances and stay together. They make their own way and have their own style. It’s a grand treat clicking them and capturing them in the video, hope you too enjoy the show. I am not a Cricket fan at all and so it’s a simple thought to have that I had no aspiration to really step in a cricket stadium ever in my life , specially by myself. And there I was in the most beautiful cricket stadium of India, which is at an elevation of 4110 feet. It is overlooked by Daulandhar Range ; OMG the snow capped peaks 3 times higher and the vultures, eagles flying over it. When the bowler must be bowling here, he can be clearly defined as the one bowling right from Himalayas. And then I had to spend time there feeling the joy of cricket fans and cricketers waving at their fans and the commentator room view. The people working over there on the ground and cleaning the ground and cutting the grass, looked so engrossed in their work and happy 🙂 . That evening I saw the sunset settling with dark clouds and I thanked my stars for I had a beautiful sunset view a day before 😉 at Naddi. Its an okay kind of place to have a crisp look on history. One can finish the round of looking on each display in half an hour max. It’s a small gallery showcasing Kangra culture, ornaments and 1905 earthquake state. I didn’t click any pictures over there. A view, which alarmed me to get up totally and get set ready for the trek to Triund. I was all set to start the trek at 7 am when suddenly it started raining. Actually it was drizzling but then I didn’t know if it would be okay to start for the trek in rain. After waiting for 15 minutes, Sanjay bhaiya (hotel care taker) told me to not to take risk, since I would trekking alone and the plan got changed. I took a drive to Kangra fort that day, so as to not to spoil the day, but I didn’t know the day had some other kind of surprise. I would mention here that fate took me there. I had no plan to go there, I just happened to reach there. Kangra fort is at outskirts of Kangra. 20 km from Dharamshala. It is the largest fort in Himalayas and probably the oldest fort dated in India. The fort of Kangra resisted Akbar’s siege in 1615. However, Akbar’s son Jehangir successfully subdued the fort in 1620. Kangra was at the time ruled by Raja Hari Chand Katoch of Kangra (also known as Raja Hari Chand II) Mughal Emperor Jahangir with the help of Suraj Mal garrisoned with his troops. The entrance to the fort is through a small courtyard enclosed between two gates which were built during the Sikh period, as appears from an inscription over the entrance. From here a long and narrow passage leads up to the top of the fort, through the Ahani and Amiri Darwaza (gate), both attributed to Nawab Saif Ali Khan, the first Mughal Governor of Kangra. About 500 feet from the outer gate the passage turns round at a very sharp angle and passes through the Jehangiri Darwaza. The Darsani Darwaza, which is now flanked by defaced statues of River Goddesses Ganga and Yamuna gave access to a courtyard, along the south side of which stood the shrines Lakshmi-Narayana Sitala and Ambika Devi. In between these shrines is a passage that leads up to the palace. It is one of the most beautiful forts in India. While I was entering the fort I thought to carry the book with me, thinking that I might get bored inside. Then, I decided not to. The clouds that day really added to the adventure and beauty. Under the dark messy clouds I entered in the fort as the first visitor at 8:05 am. Some of the fellow men joined in few minutes. Where ever I looked, I found a ruined, majestic, alone living beauty. It seemed as if Walls / passages / the steps calling me and asking to be with them. The sun hiding behind the clouds … and providing the view … magical!! There were birds having their own time and there were bigger birds, making their own passage. Somehow I always happen to click duo birds. There were trees with leaves loaded and then the ones with no leaves and there were those who had new born leaves. Each view was so very different as if various places had got combined in one. Being alone make you courageous enough to face every bit, bcoz you don’t have a choice and be so. Being alone makes you know yourself better. Being alone makes you know your needs candidly. Being alone on a travel leads to become a storyteller. They say the world needs more storytellers than engineers, doctors or technicians. Let us heal our minds. #Solivangant feeling it was to click this. After about half an hour a group of students from a school with teacher had come over and of course I could recall my school time and the small visits around. This exit door is of Kangra Fort. Look at this, you’ll find some unusual scribble. Rather than the usual ‘I love so and so…’ You’ll see ‘I am single..’ Etc with the names. Discovery of an unusual sort of declarations… !!!!! While I was stepping out, I witnessed for seconds the view in the sky where in hundreds of birds were flying in one direction. It was such a sight of unity and togetherness and bonding and leadership and happiness and peace and what not, there was no competition; there was only a way, a common way to fly and reach to a new destination to have more fun. The moment I sat in the car to get back to Mcleodganj I wondered if we humans could be that relative and sequential, without any agony and competition live like that, happily! Imagine, there would be so much of peace and dancing and celebrations only, if at all we don’t compete and greed !! Vicky bhaiya, my driver for that day pushed me to go back to the hotel, change my shoes and take chance to trek to Triund. He told me that the weather might have changed and he checked with his local friends and hence, the trek to Triund happened. 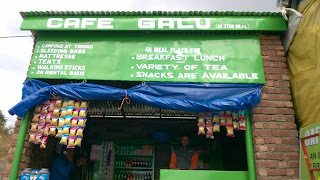 There was a Café at Galu point ; its called café but is actually a shop; that bhaiya served me Egg Amulet and Chai. It was my breakfast and I was so damn hungry to grab all. At the starting point at Gallu point Police men have to be on duty and they ask every visitor, who goes on trek to make an entry with details in a register. I guess they do so for safety measure and information sake. There are a lot of junctions on the way to Triund where phone network doesn’t appear and hence connectivity could be a concern; but then one sometimes need to be away from man made traps and stay in the lap of nature and enjoy every bit. The way to Triund was really interesting. In starting it felt as if I was walking through a forest and then there were hard rocks to climb on. Yes I did it, the Triund trek. Indradev showed courtesy and the rain stopped, the weather improved and I took out my trekking shoes, tied the laces and started..
Out of 5 kms from Galu Devi, I could trek for about 3 and 1/2 kms on the hill and had to return as it started raining heavily. Raincoat used to the best 😂. Nevertheless I am happy to share that I dared to go that far and up…. Alone! It’s an amazing way and the feel’s ineffable. While going up all I had in mind was the snow point , while walking back all I had in mind were favourite songs and finally it was a perfect walk on the hills, with the raincoat, songs on the lips, zig zag way, wet leaves, shining ones, cold breeze, strangers greeting each other, and the view down – beautiful. After all the view is always worth the climb. My favourite saying – ‘ye safar hi to hai, Jo khoobaoorat hai, kahin pahunch kar Kisi KO kuch nahi milta’ / I have enough and much from this trip . I am so proud and grateful that during childhood,I have been taught to climb mountains (mountains of life and the mountain in real)and have been made strong enough. I happily returned to the hotel and spent my rest of the day in the market by having famous Pizza and Chocolate fudge at Jimmy’s Italian kitchen. I visited Kalachakra Temple, as my last spot. Its very much in the market area. Surrounded by a lot of prayer wheels, has a huge statue inside and the view of sunset from the second floor up there was very beautiful. Have a look. Heavy clouded sky meets another sunset and I standing speechless staring at the magic that the nature brings each day. Click from a monastery at main chowk of Mcleodganj. So much shower of hopes this view has, isn’t it. – I was treated so very well by every person I met, from hotel care taker to restaurant wala, to strangers who met me in the bus to everyone. – A stranger proposed me to marry (someone I met just for 15 minutes, for may be he found me bold and different travelling alone) and I could take it as a compliment and very politely could tell him a No, yet smile and feel good, ya it was a good feeling he gave. We bid each other bye and look, you are reading about him here J . – I am a more confident person and have got more experiences to share. – I had bought Trekking shoes especially for this trip and I guess have created an asset that way. – – I carried a book with me thinking that I might need it, when I get bored. – No book read at all, not even a page. – – I carried an I-pod –full with songs – didn’t listen to any… there was no need. The interesting part about music was – Driver bhaiyas on all days had songs of 90s and that was pretty interesting to listen to and refresh the list to be heard. But we again get up, make up for every break, failure, loss, misplacement and start a new journey every day. Keep getting up, keep reading, keep exploring, keep learning and keep travelling. Hope this read was interesting enough & useful. *Click follow for getting updates 😊.